BOSTON (AP) — Instant replay, meet the Pesky Pole. David Ortiz hit a three-run homer high over Fenway Park’s right-field foul pole on Wednesday, helping the Boston Red Sox rally for a 4-2 victory over the Texas Rangers. The fair call was confirmed by a replay review, according to Major League Baseball’s replay Twitter account. "It was pretty close, but I knew it was fair," said Ortiz, who watched the ball sail into the seats before leaving the batter’s box. "I wanted to make sure it was fair. I wanted to keep watching it." The Rangers took a 2-1 lead in the top of the eighth and brought in Neal Cotts to face Ortiz with one out and two on in the bottom half. Ortiz, who had been 0 for 5 with five strikeouts against Cotts, lined a 1-1 fastball down the right-field line. Because the ball was much higher than the pole, which was named for former Red Sox shortstop Johnny Pesky, it was hard to tell where it crossed into foul territory. The pole is just 302 feet from home plate. "From our angle, it’s extremely difficult to tell," Red Sox manager John Farrell said. "We felt like it would be inconclusive at best with any type of replay that was available." Umpire Jerry Meals signaled a home run. Rangers manager Ron Washington waited until Ortiz crossed home plate and came out to ask for a review. After a brief chat with home plate umpire Jordan Baker, the crew went to the visitors’ dugout and returned a short time later to confirm the original ruling. After 44.1 seconds, the play was upheld. "You can’t count the big boy out. You can’t count this ballclub out," said Red Sox starter Jake Peavy, who did not earn a decision after leaving a 1-1 game in the seventh inning. "Once again, you had the big man up in a big situation and he comes through." Andrew Miller (1-0) earned the victory despite allowing the Rangers to score the go-ahead run in the top of the eighth. Koji Uehara pitched the ninth for his second save. Alexi Ogando (0-1) allowed two runs in the loss. "Ortiz is one of the best and one of the clutchest hitters," Rangers shortstop Elvis Andrus said. The Red Sox scored in the third inning on two walks and a swinging bunt single that was thrown away for an error by pitcher Robbie Ross. The Rangers tied it in the seventh on Mitch Moreland’s homer and took a 2-1 lead in the eighth when Andrus scored on Alex Rios’ sacrifice fly. But Ogando walked Jackie Bradley Jr. to lead off the bottom half, and then A.J. Pierzynski blooped a popup down the right-field line that fell in for a single. 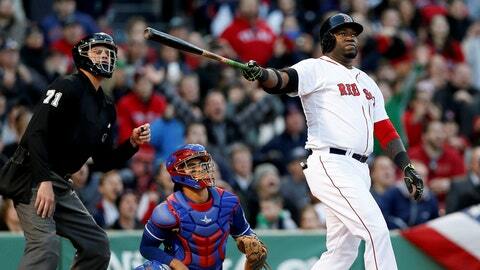 One out later, Ortiz delivered his 24th career go-ahead homer in the eighth inning or later. "I felt comfortable with Neal up against him," Washington said. "David won." Miller pitched one inning for the win. Ogando struck out four but was charged with two runs on one hit and a walk in his two innings. NOTES: The Red Sox activated LHP Craig Breslow and optioned RHP Brandon Workman to Triple-A Pawtucket. … Peavy left his only other start this season with the score 2-2 after 6. … Andrus has hit safely in all nine games this season. Rios had hit safely in the first eight before going 0 for 2 with a walk on Wednesday. … Adrian Beltre, who left Tuesday night’s game with tightness in his left quadriceps, returned to Texas on Wednesday for further tests.